Sounds right. It is a standard trigger wheel that is modified hence the stamped part number being the same. Look at the double wide gap in the teeth. The "floor" of the gap is higher than the gaps between the teeth. That's the difference. I made one about 6 months ago and it didn't seem to do much on an auto processor. Appreciate the info guys. I'll have to swap the high rpm one on next time the converter is out. we swapped ours last week, and the part # was the same as well. i called ford racing, they told me the difference was it was made out of stronger material as to not break. The part # on the box is M-12a227-cj13, the part # on the original was br3e-12a227-ac, ford racing told me the part # was supposed to be br3z-12a227-a on the new one. However my new one had the same part as the old. Last edited by kdanner; 12-06-2013 at 01:21 AM. Alot of people ask why the MMR Pulse Ring / Trigger wheel (on the left) is so much better than the stock or Ford Racing version (on the right) and the answer is simple. The Ford version was meant to be cheap and is just a production line, stamped sheet metal part, and in its defense - great for a factory car. 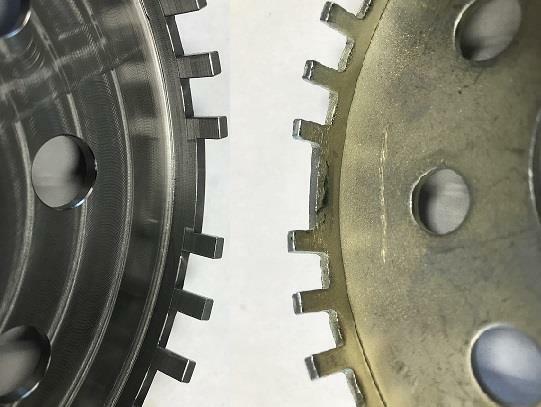 Ford noticed that higher revving applications began to have high rpm misfires, it was due to the ecu loosing the "missing tooth" , so Ford Racing modified the factory part by welding some material to the top of the missing tooth and then remachining- YES, we said welding! While this process was certainly not the best looking part, it did create a slightly better signal. The MMR part addressed all of these issues by using a 100% fully CNC machined pulse ring, this includes all of the locating holes for Perfect and repeatable timing. Each tooth is a mirror of the next, it does not have any irregularities from being stamped. The MMR trigger wheels have been tested beyond 10,000rpm and 3500hp and produce a perfect crankshaft position signal with zero misfire! This has been a dead thread for basically 6 years, guys! ... it was due to the ecu loosing the "missing tooth." requires some clarification. What is the physical phenomena, "...the ecu loosing the missing tooth." and again how does welding and remachining correct the malfunction? please explain how welding the missing tooth space and remachining corrects the problem. Hello Ed, that would be a question For Ford since they are modifying the factory stamped part and the ones welding on their product. Our part does not have any welding process on it, it is 100% cnc/billet steel construction with the raised missing tooth built into the design. Allow me to phrase the question slightly differently. Your design sounds as if it mimics the modified Ford reluctor ring by elevating the floor of the missing tooth notch. If I am correct when you chose to elevate the floor of the missing tooth notch you were trying to create a particular physical effect that the same reluctor ring without the elevated floor lacked. Am I correct?